Factory production lines know the right jig or fixture speeds production, which increases productivity. But that’s just the beginning. Well-designed tools are more ergonomic, offering both increased worker safety and productivity, as well as cost savings. Traditional machining produces heavy, costly, multi-piece tools that become an even greater liability as repetitive motion injuries erode line productivity with worker disability. Redesign means even more protracted timelines for machined parts. 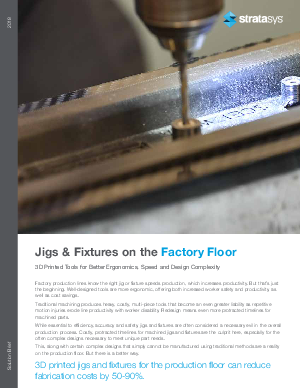 While essential to efficiency, accuracy and safety, jigs and fixtures are often considered a necessary evil in the overall production process. Costly, protracted timelines for machined jigs and fixtures are the culprit here, especially for the often complex designs necessary to meet unique part needs. This, along with certain complex designs that simply cannot be manufactured using traditional methods are a reality on the production floor. But there is a better way. 3D printed jigs and fixtures for the production floor can reduce fabrication costs by 50-90%.